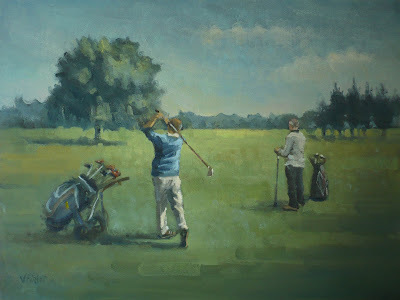 Graham and Paul at March Golf course oil on board 16"x12"
Congratulations on a great painting. Im glad Paul was pleased with it. commissions are great especially when you have good people to work with. You do hear horror stories about people who can not be pleased. You put together a very natural composition and you really drew the figures well. Hope this leads to more commissions! Happy Easter. Thanks Douglas. 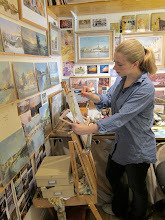 Commissions are tricky ones indeed and much more challenging than the painting you would do for yourself. I'm working on a other one for the moment which is even a bigger challenge so I'll post it when ready. 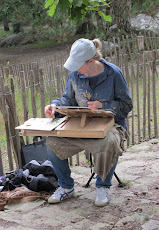 I just found your blog and and I'm definitely a follower.Thank you for sharing the photos, it is really interesting to compare it with the painting.